The inhabitants of Madrid, and especially of the neighbourhood of El Rastro, have the great custom of leaving on the street the things they want to get rid of. Walking at night gives you the opportunity to find incredible stuff, especially furniture: I’m sure you could easily furnish a whole house. 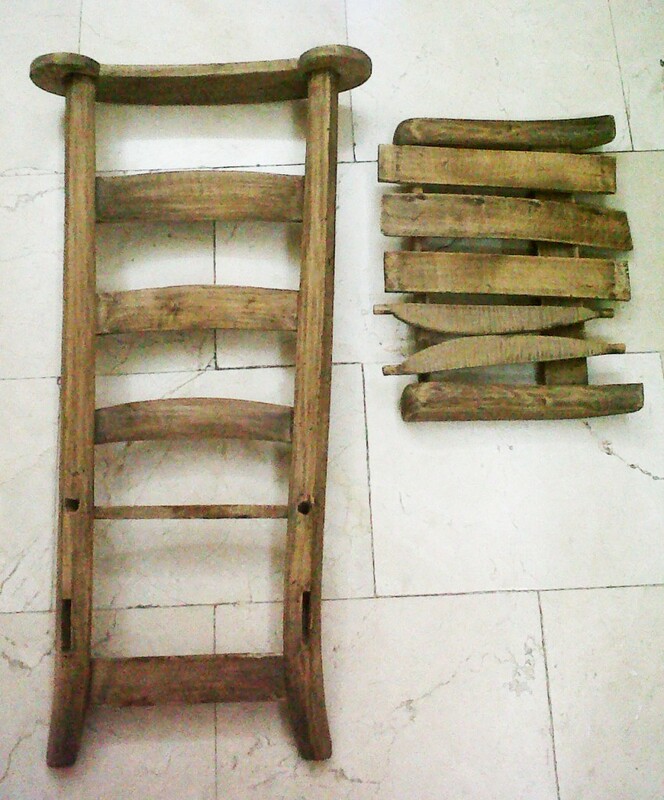 One of the things we took home was a kneeling-stool. It was old, probably from the end of the 18th or beginning of the 19th century and in a very rough shape: the wood was dark, dry, full of scratches and had many woodworm’s holes; and the typical straw seat was completely broken at the bottom and very dirty. But there was a huge potential and the shape was so nice that we had to do something with it, so of course it was time for a little diy! We started by taking it apart: we would have loved to keep the seat but there was no other solution than throwing it away. Once dismantled, we wiped it down with water and soap and then passed the entire surface with some woodworm treatment. We sealed it in a big plastic bag and left it there for a few weeks. The product we used was very stinky, so we did it outdoors with plastic gloves and mask. 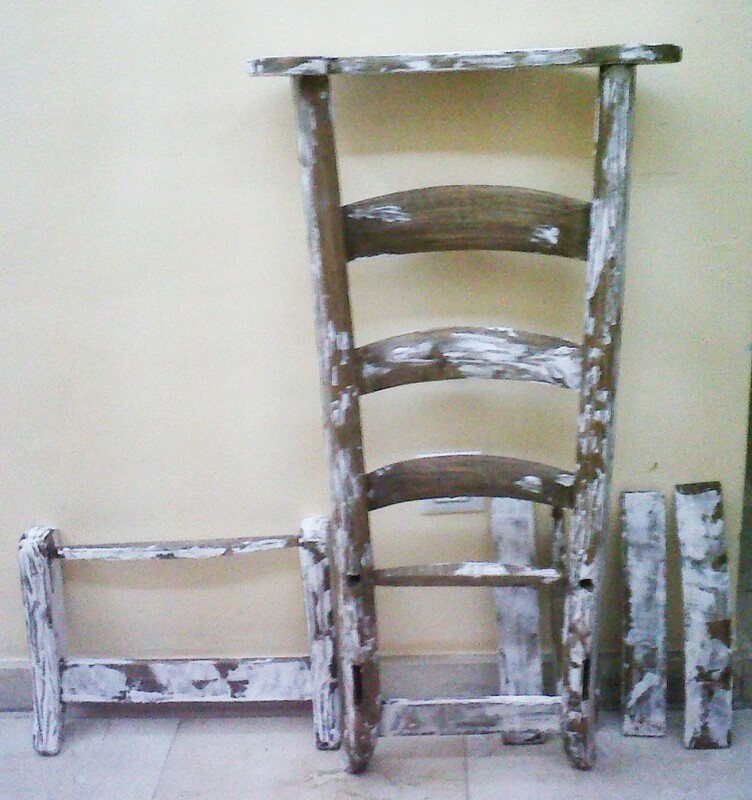 After the product had done its job, it was time to prepare the wood for painting. 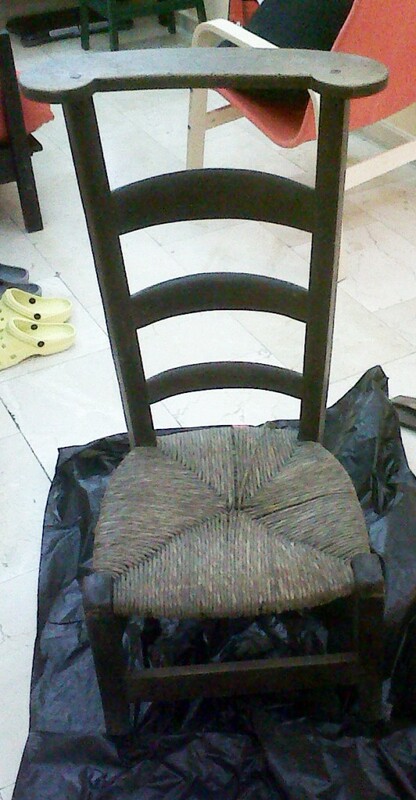 So I sanded the chair with high grit paper, because of the woodworms and of the bad shape of the wood in general I had to seal the holes and plaster the roughest parts, especially the front legs. 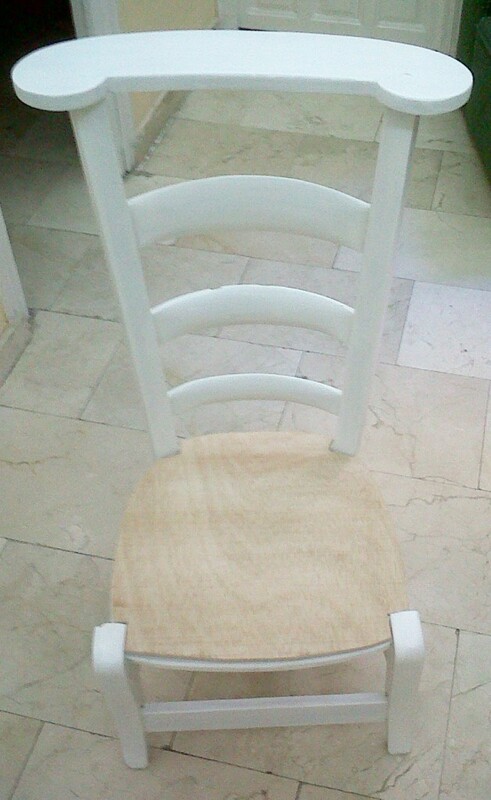 Once the plaster had dried for approximately 24 hours, I sanded the stool again, this time with low grit paper, in order to obtain a smooth surface. We reassembled it, adding a little bit of glue to prevent the joints from opening. 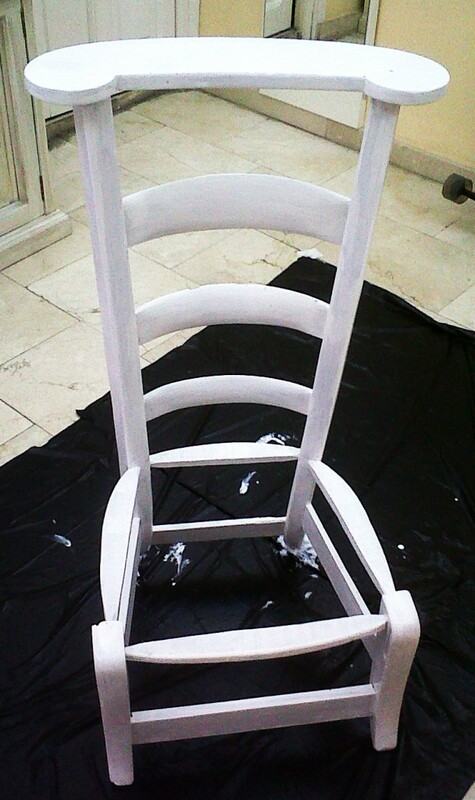 We decided to paint it a glossy white, which required three coats of paint, since I didn’t use a primer. We didn’t know exactly how to do the seat, but Matteo thought of preparing a base with plywood that would fit in between the legs. It wasn’t very hard to reproduce it on wood, since we first drew the shape on paper and then cut it out on the plywood. Once that was ready, we had some foam cut in the same shape. 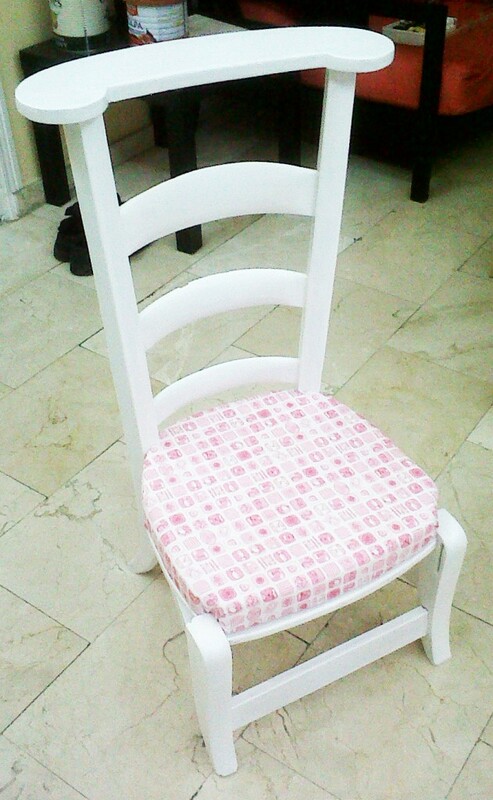 I could then cover the foam and the plywood base with some cute fabric that I had in hand. 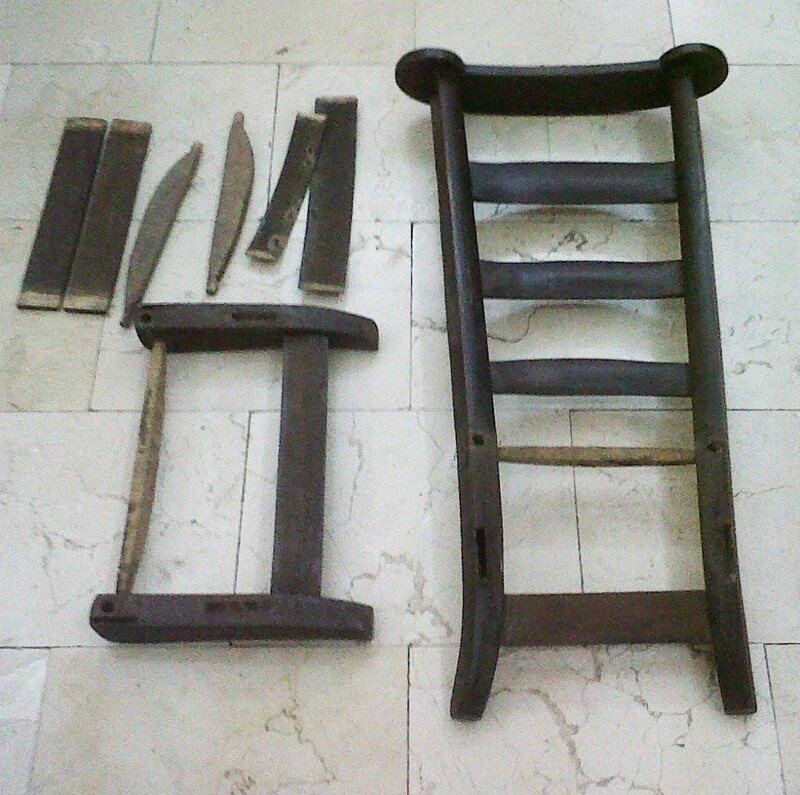 This entry was posted in Antique, DIY & Crafts, Furniture and tagged antique, crafts, diy, furniture, italy, kneeling, paint, renovation, restore, sealinthefog, spain, stool, white on May 28, 2013 by Sealinthefog.com.